I´m doing now a model kit of the M1A1 in the first (¿Second?) gulf war, and I´d like to do specifically Cougar 3, the mount of Maj (then) MacGregor, S-3 of Cougar Squadron. So, I open this post with a dual purpose: for one side, to ask questions about the Tank itself, and second to clarify if possible, things about that specific tank. So here I go! the first question is from the tank itself. The M1A1 has two protected channels in the turret roof, one long running from the back to the front left and other shorter to the right, that end in symetric points, protuding out of the sides. I guess it is some kind of sensor and it´s cabling. Can someone explain me what it is? and, any reason for running all over the roof, needing protection, instead of just popping up just in place? Related to the darker line that can be seen in the front and sides of the turret, what can it be? I´ve seen similar lines in other pictures, sometimes going up at the sides of the mantlet in a 90º turn. Is it related with the dark angled squares that can be seen in many other pictures, specially M1A2? I am only guessing but the protected cables are probably the wind sensor connection to the fire control system and the radio antenna connection to the radio. The reason would be so that there are no holes between the crew compartment and the ammo storage. The second I am absolutely sure is Velcro for the MILES (Multiple Integrated Laser Evaluation System) laser sensors. If you mean the triangular mount (with the white plug) that should be where the Multi Barrelled Smoke Grenade Dischargers (MBSGD) go. It runs over the roof as a direct hole through the front part of the turret side would compromise the armour. Much easier / better to have the hole at the rear and run the cable down a channel on the roof. I think you mean the IR panels to help with IFF? These panels (they look like square / rectangles of cardboard) were mounted on the turret and hulls to help with recognition. Nah, I think that's before they had IR panels, if that's GW1 1991? Those look like velcro strips for MILES like someone else mentioned. the lines are Velcro where they used to attach the miles sensors for training. The First picture is where the Smoke Grenade discharge harness runs under which is the 1W107-9. It runs back between the loader's hatch and the TC's hatch where it enter's into the turret to another harness. Also another Harness 1W505 is routed next to the 1W107-9 which goes to the Missile Counter Device, Measure Device or Power Cables. This harness is also routed through the turret at the same spot between the Hatches. 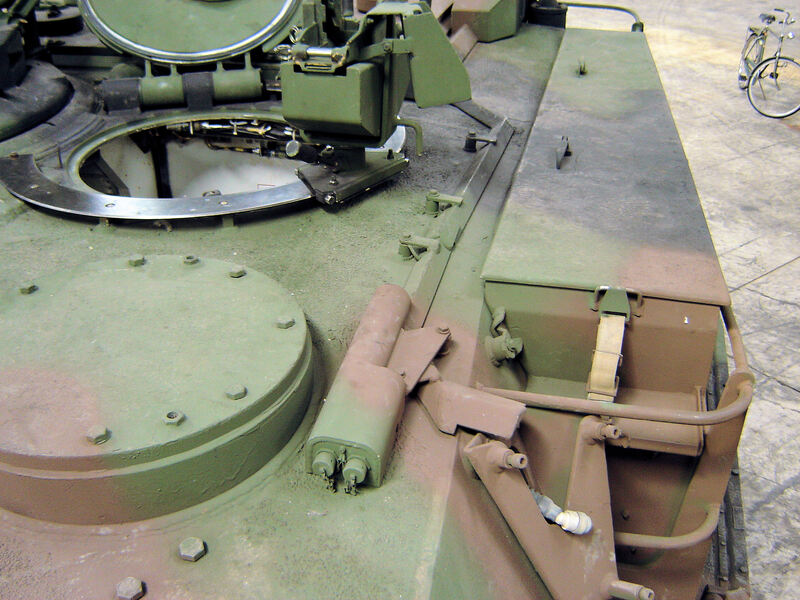 The 1W504 Harness is another harness routed next to the two stated, which goes from the EAPU Remote Control Box in the Turret to the EAPU itself located at the rear of the tank in the bustle rack. This harness also is routed between the Hatches. So three harnesses are routed all together under the cover plates. As for the second picture, like everyone stated its from the MILES Velcro glue. The Glue will stained over time without being cleaned off. Thanks a lot! I think both questions are clarified. I´m lucky to be able to ask here, it´s a pleasure to have access to nice people with such a knowledge about Armor. I guess more questions will pop up as I advance in the kit, as learning about the model I´m building is one of the things that I like most. 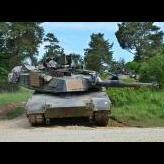 And in this case it´s related with one of the best tanks in the world, which is also one of my áreas of interest. It's worth to note that the end of connection line next to a CITV mounting point (used of course in M1A2 series), have two connector plugs. 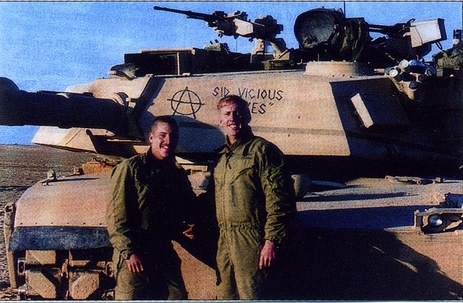 My guess is these can be used for AN/VLQ-6 and AN/VLQ-8 "soft kill" active protection systems, which is mounted around there on M1A1 series).